The HelioKlischograph K6 can be integrated as standard into the fully automated AutoCon production line developed jointly by HELL Gravure Systems, K. Walter and Bauer-Logistik-Systeme. 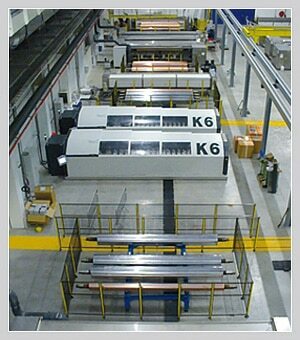 The K6 is at its most cost-effective as part of a production line. The FormManager gives the process control computer access to all engraving jobs. The computer coordinates the crane system and one or more HelioKlischograph K6 machine(s). The crane automatically delivers and removes cylinders. A single operator monitors the entire production line and ensures excellent engraver productivity. The solutions for fully automated production lines are always customized and include tailored planning and implementation. An AutoCon project management team with central responsibility is in charge of professional processing of complex installations.